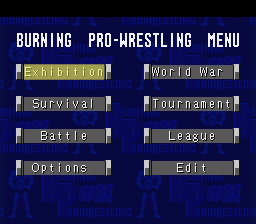 Burning Pro Wrestling is another good Japanese wrestling game. 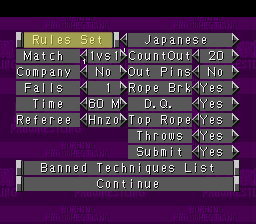 BPW offers more wrestlers, moves, and modes of play than any of the other games mentioned on this page. The only sore points in BPW are the cartoony graphics and the poor quality of the Edit options. 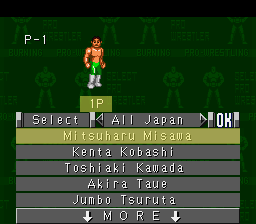 Due to the simple graphics, BPW contains over 800 moves and can allow up to six men active in the ring at once. BPW was another game that immediately caught my attention. When I first saw the it, the ROM I found was already patched with Sydra's BPW translation patch. Using this ROM, I played the 18-man Battle Royal which, despite the low graphic quality, was very entertaining. After my success with the label table in SFPWXP, I decided to try to translate BPW again. So I emailed Sydra who replied that he was also willing to finish off the translation. This translation is about 80% complete. Until I can get some translations for them, I am using some made up move names. Please do not email me about these- they are only temporary. Due to the restricted space in the tables, I had to use extra "hacked in" characters. This extra character set is added by the bpwchars.ips patch. All patches should be applied to the ROM for the full translation. Q: How can I get more character points in the edit section? A: The edit section was apparently never fully completed. It was probably intended to be like SFPWXP's edit, but had to be thrown together to meet a deadline. Anyway, there is no way that I've found to increase the point maximum for an edit character. The maximum comes from the number of points used by whichever character is selected as the model. Originally, the character's body size and head graphic going to be selectable and the point maximum would probably have been handled like SFPWXP's points, but these features do not appear to have been completed. Q: How do you access all of the moves in the edit section? A: You can't. The BPW edit section is not the greatest I've seen. BPW groups moves into four sets for the four different body sizes. (Most moves appear in all four sets - but some moves are only available to a particular body size.) In addition to the four sets, each move has a statistic (ability) associated with it and a minimum value for the statistic at which that move will be selectable. If the character's score in that ability category is not equal to or greater than the minumum score, the move will not appear in the selectable moves list. Also, you cannot set the attribute to 10, select the move, then set it back to a lower score. Whenever an attribute is changed, the game checks all of the character's selected moves. If any of the moves are no longer selectable, the game will replace them with a default move for that category. Q: When I load a ROM character into the editor, half his moves are gone. What's happening? A: Most of the ROM characters use moves that are not allowed by the minimum ability score rule described in the previous answer. When you attempt to load these characters into the editor, the editor replaces all moves that violate the rule with default moves for the respective category. This often has odd effects on the character's trademark and finishing holds also.